The Atla Annual Yearbook is an annual compilation of Atla business reports as well as reports from Atla's committees, task forces, and other groups. 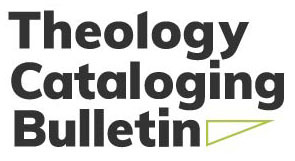 Theology Cataloging Bulletin, a publication of Atla, contains information about new and changed Library of Congress Subject Headings and Classification numbers, upcoming training opportunities, bibliographies of recently published articles, and other information of interest to religion/theology catalogers. Official serial publication of the Australian and New Zealand Theological Library Association.